NEW YORK (Reuters) - Stocks ended a holiday-shortened week with mostly modest gains on Thursday, though the S&P 500 notched its biggest weekly advance since July as Morgan Stanley and General Electric rallied after strong results. The two were the latest to post earnings that topped expectations, helping to lift the S&P 500 and the Nasdaq to their fourth straight daily advance. Tech bellwethers Google and IBM fell on disappointing figures and limited the broader market's gain. IBM's slide pushed the Dow into slightly negative territory at the close. Morgan Stanley (MS) rose 2.9 percent to $30.76 after the financial services company reported a rise in first-quarter earnings, while Goldman Sachs (GS) edged up 0.1 percent to $157.44 after reporting earnings that fell less than expected. General Electric (GE) posted a 12 percent rise in overall industrial profits and its stock gained 1.7 percent to $26.56. "Today's earnings were mixed, with some beating and others missing , but the results we've seen this week have given the season a positive tone," said Kate Warne, investment strategist at Edward Jones in St. Louis, which has $787 billion in assets. "We had expected a greater impact from weather, but industrials and banks are all doing better, which relieves that area of concern." Tech shares capped the S&P 500's gain, with Google Inc (GOOGL.O) down 3.7 percent at $543.34 and IBM (IBM) off 3.3 percent at $190.01 a day after both reported earnings that failed to impress Wall Street. The results raised questions about those of other tech-sector companies. The Dow Jones industrial average (^DJI) slipped 16.31 points, or 0.10 percent, to end at 16,408.54. 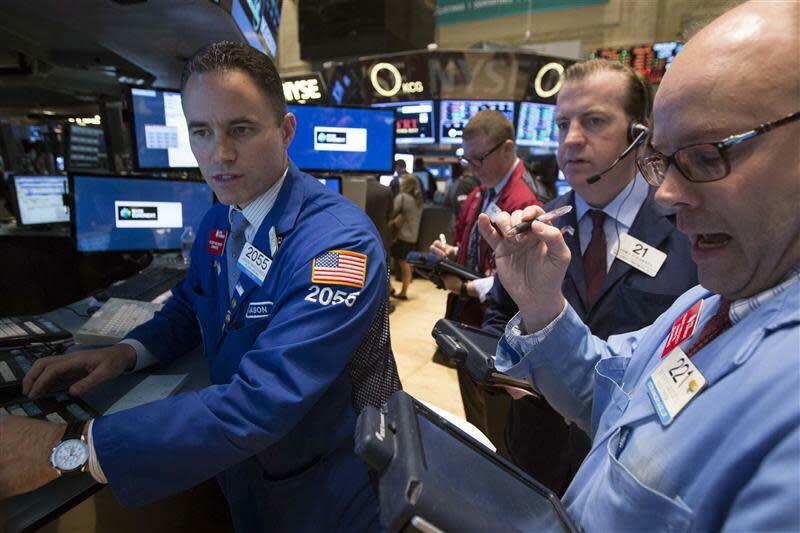 The Standard & Poor's 500 Index (^GSPC) rose 2.54 points, or 0.14 percent, to finish at 1,864.85. The Nasdaq Composite Index (^IXIC) gained 9.29 points, or 0.23 percent, to close at 4,095.52. For the week, the Dow rose 2.4 percent, the S&P 500 added 2.7 percent and the Nasdaq advanced 2.4 percent. The Dow had its best week since December while the S&P 500 closed out its best week since July. Trading volume was light ahead of the Good Friday market holiday. About 6.1 billion shares traded on all U.S. platforms, according to BATS exchange data, below the month-to-date average of 6.88 billion. The CBOE Volatility index (^VIX), a measure of investor anxiety, fell 21.6 percent over the week, its biggest weekly drop since January 2013. After the closing bell, Advanced Micro Devices Inc (AMD) reported first-quarter results that beat expectations, sending its shares up 2.9 percent to $3.86 in extended trading. During the regular session, SanDisk Corp (SNDK) was the S&P 500's biggest gainer and helped boost the Nasdaq 100 (.NDX). SanDisk's stock shot up 9.4 percent to close at $82.99 a day after the company reported first-quarter revenue ahead of expectations. Baker Hughes (BHI) shares hit their highest price since August 2011 after the world's third-largest oilfield services company posted better-than-expected results as revenue in its core North American business rose nearly 7 percent. The stock climbed 3 percent to close at $68.33 after earlier rising as high as $69.78. UnitedHealth Group (UNH) fell 3.1 percent to $75.78 after the health insurer said it has spent more than $100 million to cover a pricey new hepatitis C drug from Gilead Sciences (GILD), a higher cost than it expected by "multiples." Peer company WellPoint (WLP) slid 3.8 percent to end at $92. Questions from U.S. lawmakers on the cost of that drug prompted a sharp selloff in Gilead in mid-March that lasted for nearly a month. The stock rose 1 percent to $70 on Thursday. The latest data showed the U.S. economy's health was improving. The number of Americans filing new claims for unemployment benefits rose less than expected in the latest week and came near pre-recession levels. Factory activity in the U.S. mid-Atlantic region expanded in April at a faster clip than anticipated, according to a survey from the Federal Reserve Bank of Philadelphia. Shares of China's Weibo Corp (WB.O) opened slightly below the $17 pricing of its initial public offering, which was at the lower end of expectations on concerns about the microblogging service's slowing user growth. The stock, however, turned sharply higher in afternoon trading and ended up 19.1 percent at $20.24. Western Union (WU) fell 5 percent to $15.25 after Wal-Mart Stores (WMT) said it was launching a domestic money transfer service in partnership with Euronet Worldwide (EEFT) subsidiary Ria Money Transfer. Shares of MoneyGram International (MGI.O), which currently provides money transfer services for Wal-Mart, plunged 17.7 percent to $14.81. Euronet rose 4 percent to $42.44. Wal-Mart gained 0.6 percent to $77.66. About 56 percent of stocks traded on the New York Stock Exchange ended the day higher while 61 percent of Nasdaq-listed shares ended in positive territory.